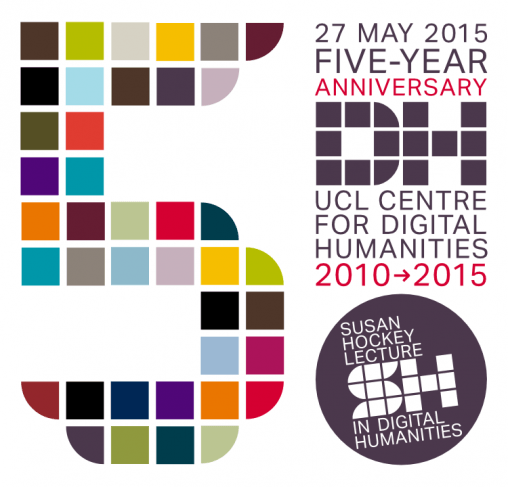 Five years ago, we were in the final run up to the official launch of UCL Centre for Digital Humanities, at an event that happened in May 2010. And such a lot has happened since then! We’ve worked on a range of projects, from helping sort out linguistic issues with domain names and how best to provide access to UK Census data, from peering into the Slade Archive, to looking back at the history of Digital Humanities as a discipline, from looking at cultural aspects of European identity through large volumes of textual materials, to reading archival materials using Handwriting Recognition Technology. These, and more, can be seen over at our projects page. We’ve even won awards for our work on Transcribe Bentham, the Great Parchment Book, and the Day of Digital Humanities (2012). What a five years we have had! Time for a party, dont you think? But how shall we celebrate? We wanted to launch something that was forward facing, as well as having a “well done us” event that is backward looking. But what to do? One of the things our field as a discipline – given it is so new – lacks, is named lectures: annual invited series where esteemed academics can have a public platform to speak about their work. So we decided that, for our fifth birthday, we would launch one! And who else to name it after but Professor Susan Hockey? Susan Hockey is the Emeritus Professor of Library and Information Studies at UCL, and was Director of what was then the School of Library, Archive and Information Studies (now the Department of Information Studies) from 2001 to 2004. Before coming to UCL, she held positions at Oxford University, where she is an Emeritus Fellow of St Cross College, at Rutgers University and at the University of Alberta. As chair of the Association for Literary and Linguistic Computing from 1984 to 1997 she founded the journal Literary and Linguistic Computing, now the Journal of Digital Scholarship in the Humanities. She has published widely on text analysis applications, markup, teaching computing in the humanities and the role of libraries in managing digital resources. In 2004 she became the third holder of the Busa Award, a lifetime achievement award for the application of information and communications technologies to humanities research. We are absolutely delighted that to mark #UCLDH5, Susan Hockey will be giving the first inaugural lecture of the annual Susan Hockey Lecture in Digital Humanities. The lecture, Digital Humanities: Perspectives on Past, Present and Future, will take place on Wednesday 27 May 2015, at 6pm (exactly five years after UCLDH was formally launched!) in the Sir Ambrose Fleming Lecture Theatre, Roberts Building, UCL. Everyone is welcome, but spaces are limited so please do register to attend. There will be cake! And we hope you like our 5th birthday graphics, done (as ever) in our inimitable house style, by our designer at large, Rudolf Ammann. Cant have a UCLDH5 party without a logo! – we hope to see you there.